International trade and investment issues grow more complex and require major re-consideration by governments, firms and individuals. No-one is exempt from the new policy directions of the U.S. government and the impending British exit (BREXIT) from the European Union (EU. They are accompanied by extensive security concerns and the need to manage vast immigration flows. Many of the accompanying political battles are not only driven by national options, but reflect the “because we can” principle. While U.S. policy changes are still under construction, Britain delivers the EU separation documents consonant with Article 50 of the Treaty of Lisbon by the end of March which then marks the bureaucratic starting point of BREXIT. The British separation encourages other nations to seek acceptance of their special desires as well. But when there is a re-allocation of payments and supports, who will be the beast of burden and at what price? Also, what is the role of innovation and timing? As the United States discovers, being the first with good ideas and their implementation does not always pay off. The self-inflicted British exit can weaken the economic relationship between the U.S., Britain, and the European Union. A U.K. departure shifts the entire European unification from an outlook of optimism and growth to a fear of long term division. Britain’s significance as a business cluster is declining. Less demand for currency will keep the value of the pound and of non-Euro currencies low, but also gives their governments more ability to adjust and manage their currency and trade accounts. Relative salaries, housing prices, innovation and new ventures will become less robust. The plans of many people to establish their life in Britain will change. Inward tourism may rise but outward travel will suffer. Fascinating on a psychological level is the fact that most people, on either side of the Atlantic, continue in a very protective phase of denial when looking at possible effects, both short and long term. Such a limited focus is restraints the willingness to prepare, since “it just won’t happen here to me.” Time will tell about the wisdom of the reduced response rationale. In the interim, the signs “We are European” may help shore up a countermovement to BREXIT. American outward Foreign Direct Investment (FDI) will change .Every day almost one million people go to work in America for British companies. More than one million people go to work in Great Britain for American companies. Under new conditions, these numbers might shrink. Friends and adversaries do not require winners and losers. With all the physical, technical and information resources now easily available, we must search for the spiritual soul of business, and make it catch up with the physical body. We all must contribute to find new paths to help others by sharing their burden. They in turn must be willing to share ours. It used to be said that the United States and England are only separated by a common language. The near term future may see more separation of the two by new negotiations. There is the opportunity to improve relations with new negotiators who are not only rear view mirror oriented, risk averse or restrictive. Using past configurations as mile stones can help simplify future trade policy, but without mandatory orientation. 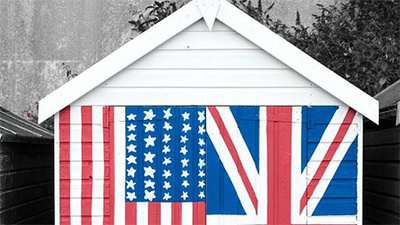 Bilateral discussions between the U.S. and the UK must focus on the building of strength. Global openness with reasonable partners, accompanied by transparency, and in support of balanced consumption are key objectives for progress towards a better human condition. During his presidential campaign in 2016 Trump promised a 3 to 4 percent economic growth to be accomplished through steep corporate and individual tax cuts and spending on the country’s infrastructure, i.e., constructions such as roads, airports, and tunnels. That’s the rosy envisioned scenario. The sad reality of the situation, like much envisioned in Trump’s alternate reality (based on his “the art of the deal”) is much more sobering. According to 50 economists surveyed by the National Association of Business Economics, the economy will grow only 2.3 percent this year under Trump’s presidency. So much for the claim of having a savvy reassuring businessman, a risk taker entrepreneur at the helm of the ship of state. Actually, the only two businessmen we have had as presidents of the US were Hoover and George Bush. They both plunged the nations into economic woes; one with the great Depression, and the other with the great Recession. Not exactly a reassuring track record. Given that track record on “smart businessmen” entering politics, let’s keep our fingers crossed and hope for the best while preparing for the worst. Seventy percent of all economists working in academia, trade association and companies, believe that financial markets are currently too optimistic about the impact of Trump’s proposals; and that’s assuming that they get enacted. The first of these proposals dealing with health-care reform can hardly be characterized as a great success. Nevertheless economists in general remain optimistic about hiring: they expect an average of 183,000 jobs added per month this year. But they do not expect an infrastructure package, even if it passes this year, to boost the economy until 2018. Economists also predict that Trump’s tax proposals will face serious challenges before they become law, if the health care bill is any indication. Will Trump confront those stubborn economic facts or will he continue his pursuit of delusions which allegedly will make America great again? Stay tuned for an answer dictated by the facts and by truth. For the moment it’s enough to say that the stubbornness of facts has a way of catching up with those who consistently ignore them and proclaim their illusions and delusions.